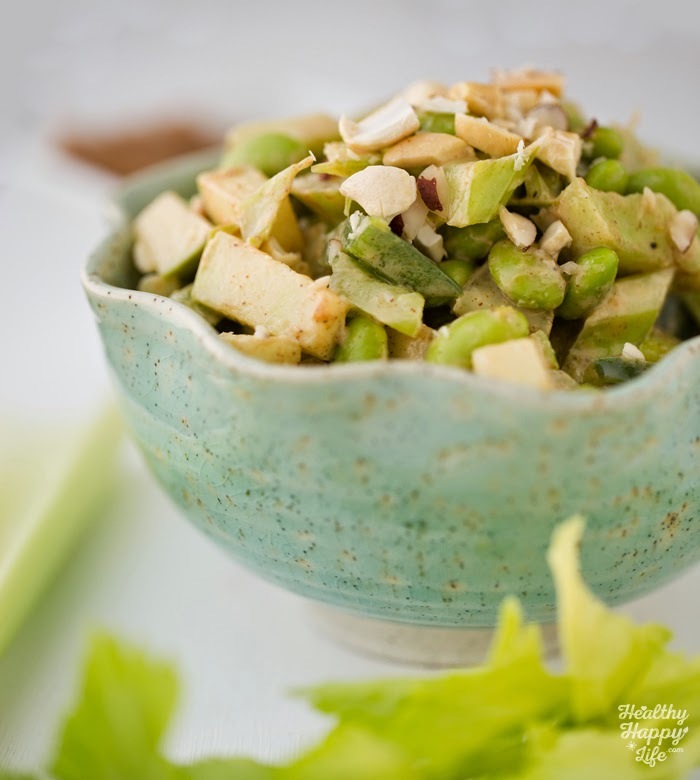 Peanutty Celery Apple Edamame Salad with a spicy kick! One of my favorite snacks as a kid was "ants on a log." 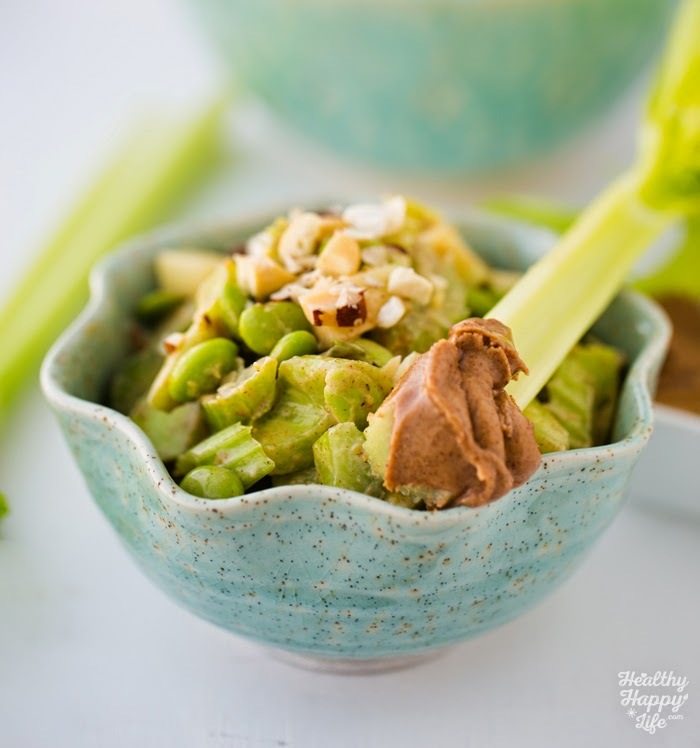 Creamy peanut butter slathered on crisp, crunchy sticks of celery, juicy raisins nestled on top. 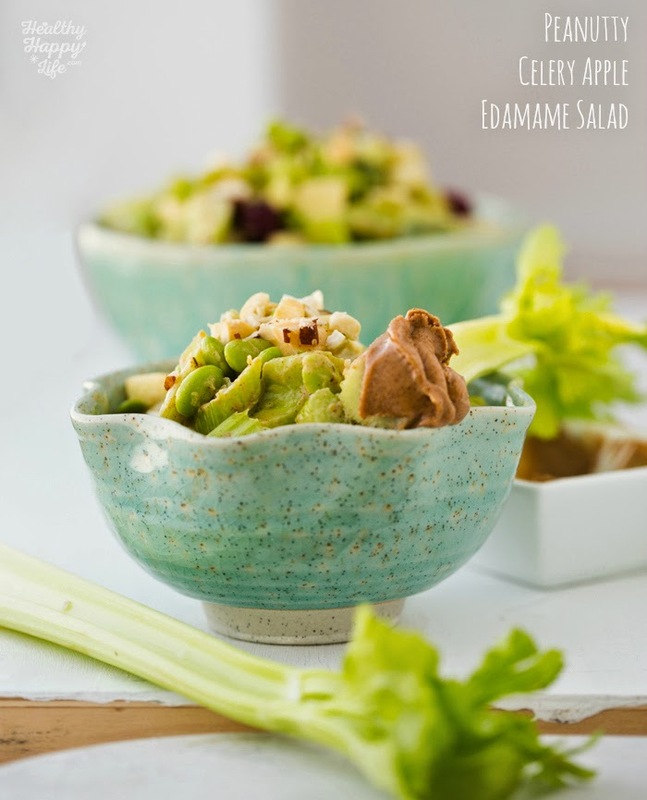 It was the perfect combination of rich and nutty, fresh and hydrating, creamy and crunchy, salty and sweet, healthy and indulgent. 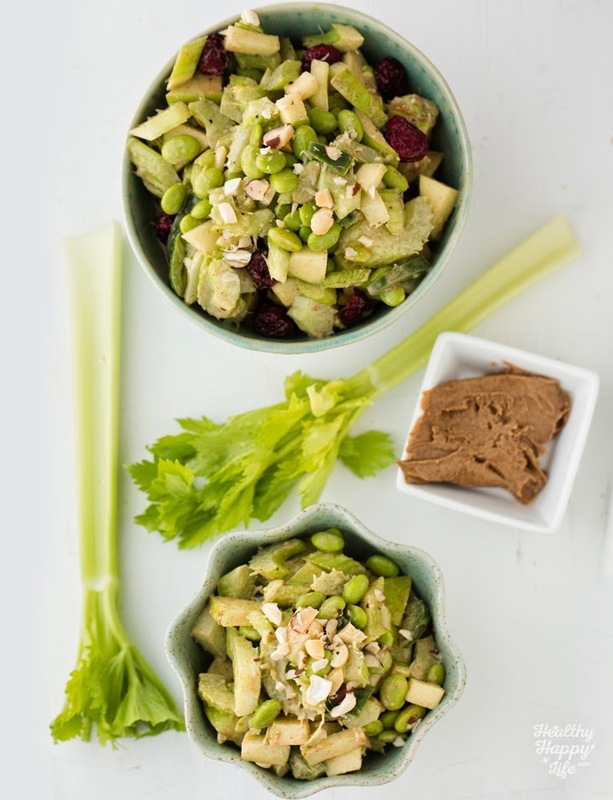 Well if you are like me, you probably love that classic combo of celery and nut butter, and maybe even apple and nut butter. So good! Well today's recipe is inspired by my love of all those kid-approved snacks, whipped up into a very adult-approved side salad, snack or meal! 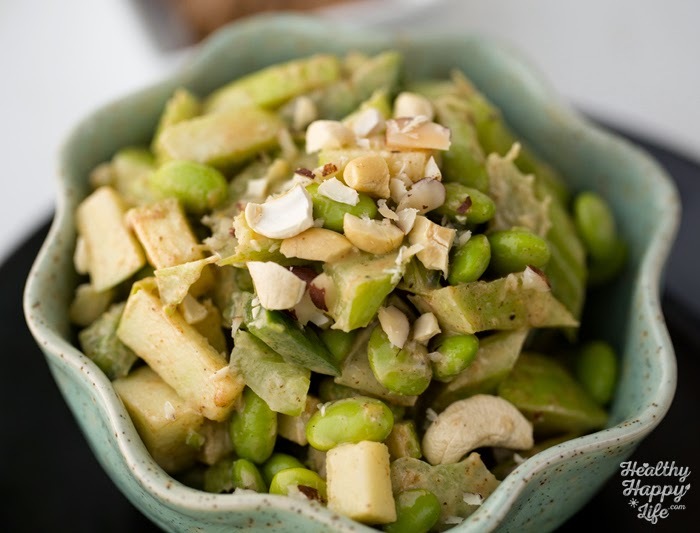 Get my Peanutty Celery Apple Edamame Salad recipe. And yes, you can substitute with almond butter, sunflower butter or another favorite nut or seed butter!.. Crunch, crunch, crunch. Thank is the sound this yummy salad makes. 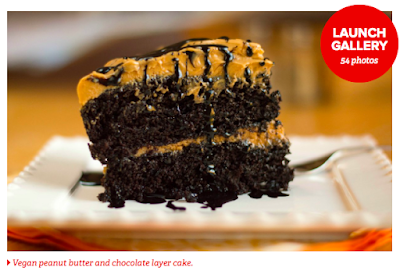 Did you know that March 1st is Peanut Butter Lovers' Day? Yup! Well I wrote a blogpost over on Parade's community kitchen with 55 Recipes for Peanut Butter Lovers! All recipes were submitted by FindingVegan.com bloggers. Check it out.. So many ways to serve this salad! Add it to a wrap or pile it on a sandwich with even MORE peanut butter. Add it to a leafy greens salad or serve alongside just about anything. Pile it in a pita with some warm hummus and thinly sliced red onions. Or serve it alongside a giant veggie burger as a picnic-y salad side. 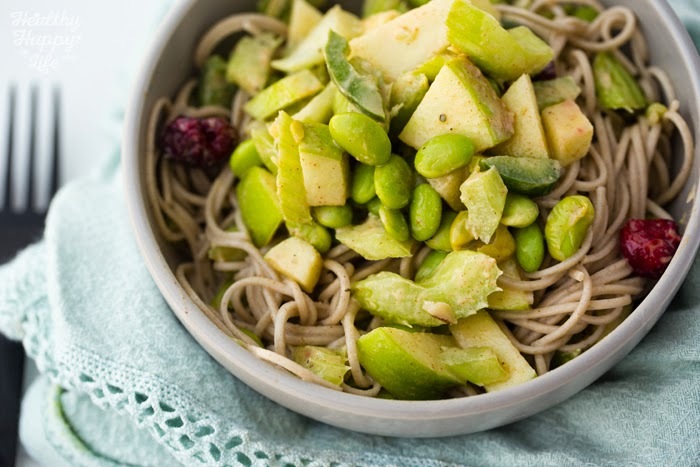 Toss it with some peanutty soba noodles or plain soba, or any warm pasta. 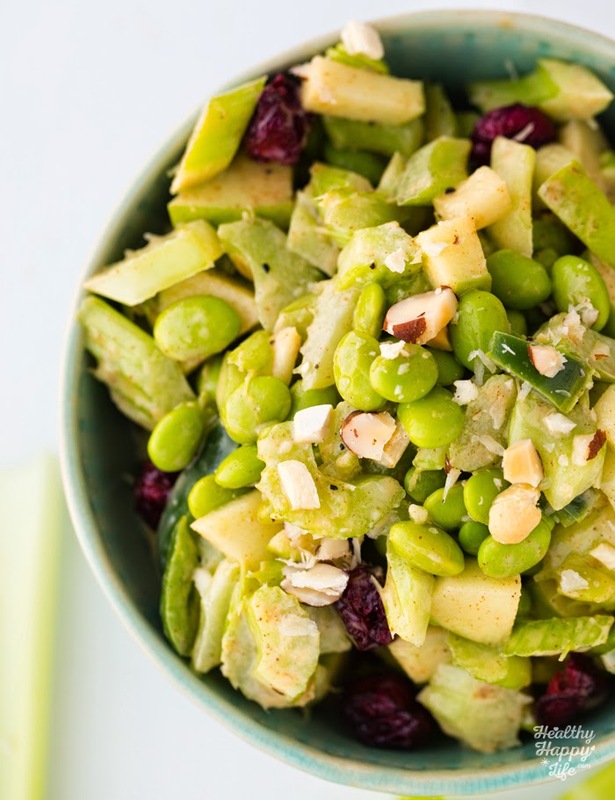 How will you serve this versatile salad?? Nut butter goodness in every crunchy fruit and veggie bite! 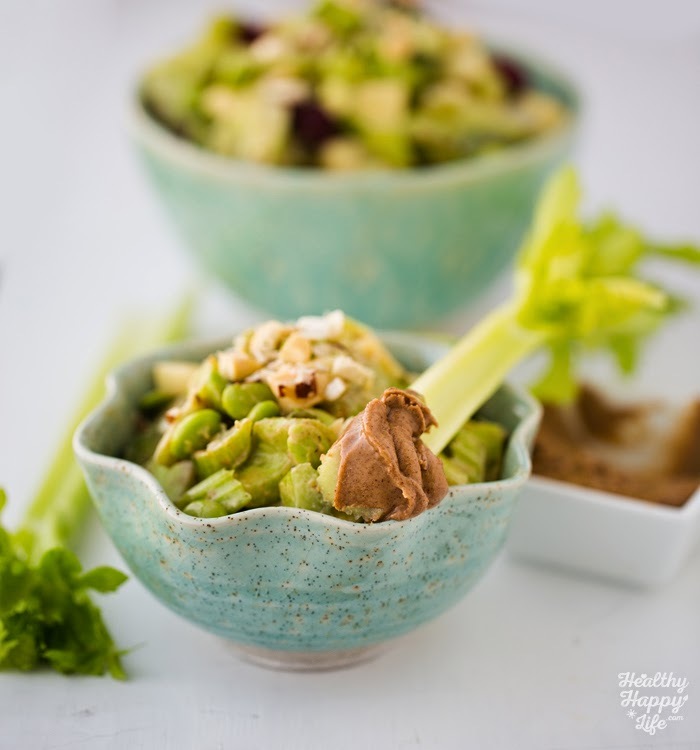 Crunchy, sweet, salty and nutty, this delicious salad has it all! 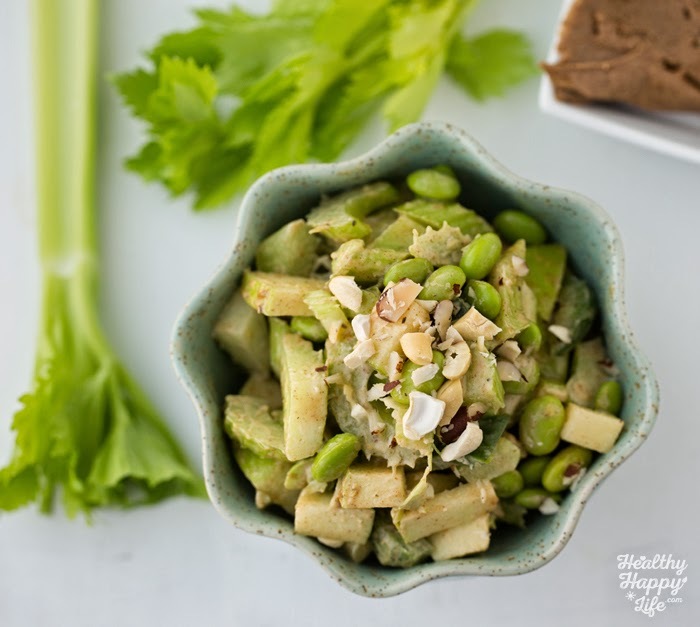 Celery, green apple, protein-rich edamame and plenty of nut butter flavor in every spicy-kick, sassy sweet bite. Optional: serve over top warm rice, soba noodles or another warm grain ingredient! Add the chopped celery, chopped apple, lemon juice, salt, pepper and jalapeño to a large mixing bowl. Toss well so the lemon coats the fresh ingredients. 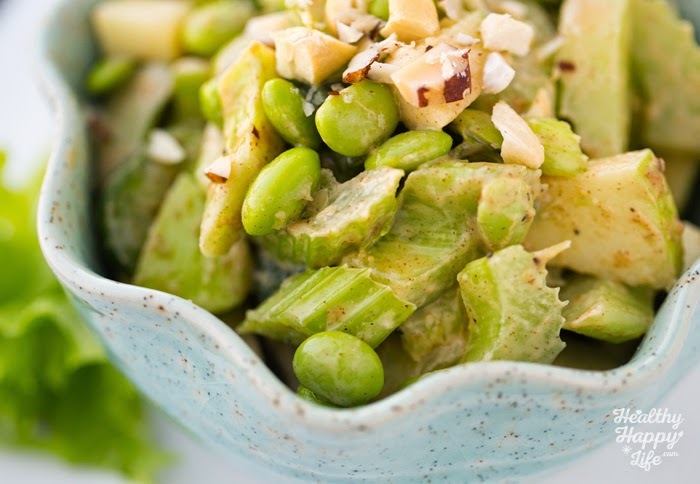 Warm up your edamame so that it is steaming hot when you ad it to the bowl. For the nut butter: if it is rock hard, you may want to soften it by leaving it at room temperature for a few minutes, or softening in the microwave. 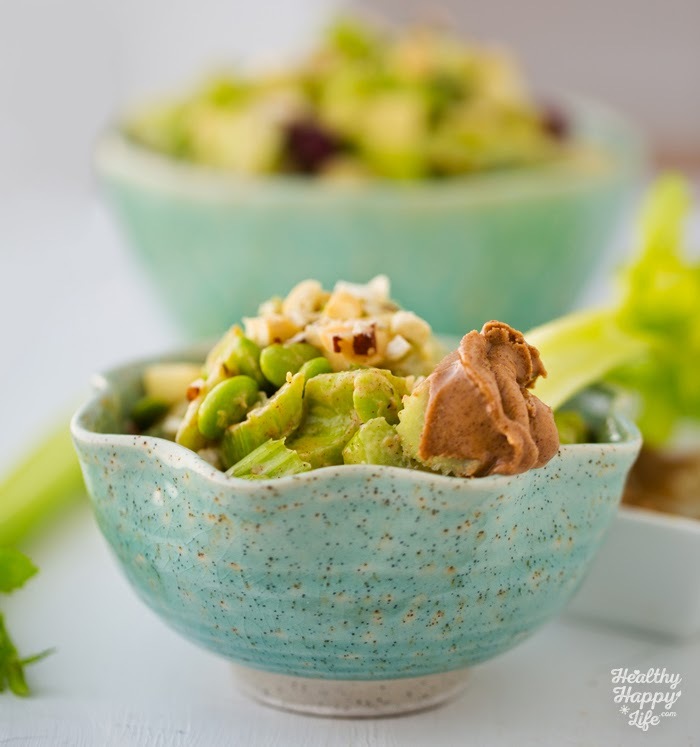 Spoon the soft nut butter into the large mixing bowl and using a large spoon, start toss thign salad with the nut butter. 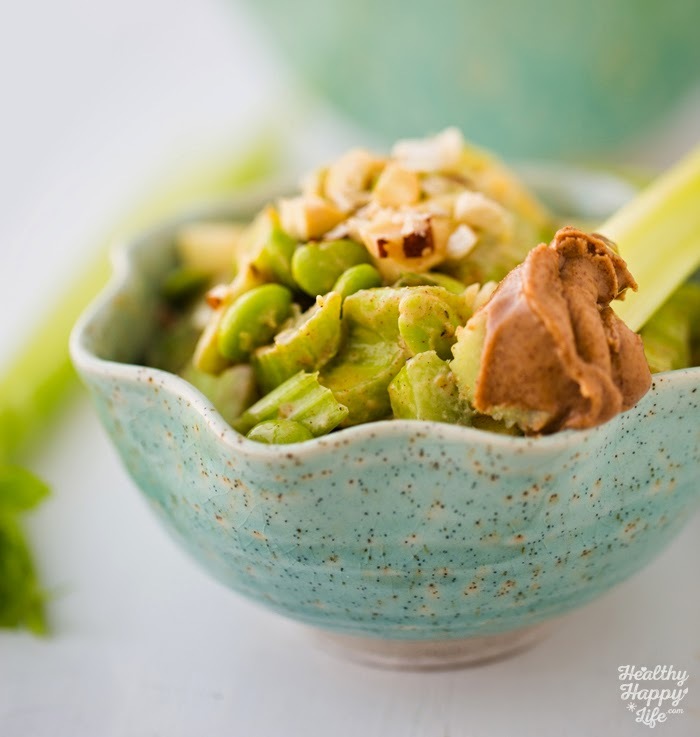 Fold and stir for about 2-3 minutes so that the nut butter evenly distributes itself among the ingredients, creating a peanut sauce, coating everything. Fold in the optional dried fruit. Serve right away or allow the salad to marinate in the fridge for at least an hour before serving. This salad is delicious served on its own, or served over top a warm grain or pasta like soba noodles.